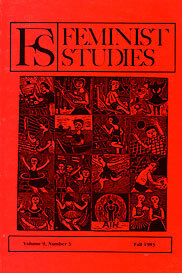 Although this issue of Feminist Studies offers a sampler of topics and methodologies in feminist scholarship, theory, and creative expression, patterns emerge in the framing of issues, questions, even disagreements. The first two articles represent the achievements of feminist scholarship in recovering what has been lost or obscured in the past and in reconstructing the shape of our cultural and intellectual legacy. 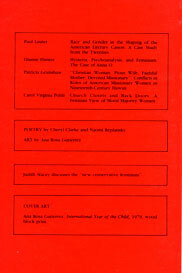 The third article applies concepts developed by feminist social historians to the experience of nineteenth-century women at once unique and representative of their class and era, and draws conclusions about women's roles in the public and private sphere relevant to current debates on that subject. The final two articles turn more explicitly to questions of strategy for our own times. They look, respectively, at the lives of contemporary evangelical women who ostensibly oppose feminism, finding potential allies, and at the texts of contemporary theorists who ostensibly support feminism, finding a deeper estrangement among "feminisms" than many of us have been willing to acknowledge. Paul Lauter's article on race and gender in the shaping of the literary canon documents some of the precise institutional and historiographic processes that led to the emergence of the canon of American literature as most typically taught, read, and criticized today. In detailing how the works of women and writers of color were excluded from the canon, he reminds us that the canon itself is a social construct, the product of an increasingly professionalized and masculinist literary establishment. He proposes not only the inclusion of "lost" texts but also, more significantly, an American literary history reconceptualized around categories less static and exclusive than the old "periods," more inherently inclusive of the literatures of women and people of color in the United States.